The massive 27 gram 5 shilling (or crown) was only minted for Australia in 1937 and 1938. 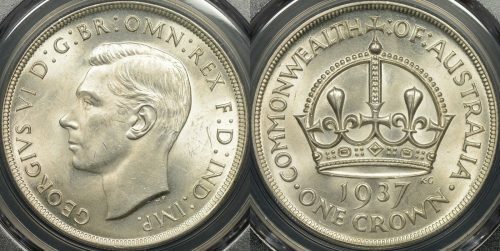 The 1937 crown had a mintage of just over 1 million, but it’s size and unpopularity with the public meant that only just over 100,000 1938 dated examples were minted. The sheer size of the coin makes it susceptible to bag marking during the production process. As a result most mint state examples have been graded by PCGS as MS63 or lower. 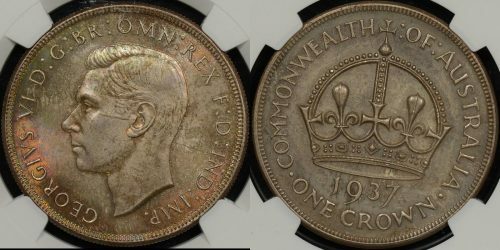 Obviously given the disparity in mintages the 1937 crown is the more affordable example for the collector with a tighter budget. Those with deeper pockets might look for a MS graded 1938 coin, but typically the strike on that year is not as strong as the 1937. When purchasing an Australian Crown look for a PCGS or NGC graded example as it is a commonly counterfeited coin. Assessing quality of strike means looking at the hair above the King’s ear on the obverse and looking at the quality of the cross on the orb at the top of the reverse. Obviously minimal bag marks and original surfaces are considerations that must be taken into account.